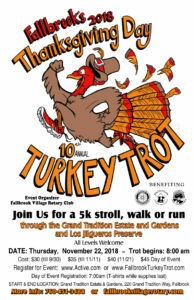 2018 Annual Fallbrook Thanksgiving Day Turkey Trot is a fun family Thanksgiving morning to come together with the community to raise money for the Fallbrook Village Rotary Club Foundation while feeling good and creating memories of a lifetime. Our goal is to raise funds for the Fallbrook Land Conservancy, Fallbrook Animal Sancturay and the Fallbrook Community(s). FALLBROOK VILLAGE ROTARY CLUB has donated monies to the community (s) and international since 1984. Rotary is a leadership organization of local business, professional, and civic leaders. Members of Rotary meet regularly, get to know each other, form friendships and through that, we are able to get things done in our community. To join leaders in your community, visit a club near you.